So we are just a few weeks away from Halloween (I know can’t believe it either!) As a kid I loved getting dressed up for trick o’ treating. The best part was sorting through the collected “treats” to find the best candy when we got home. 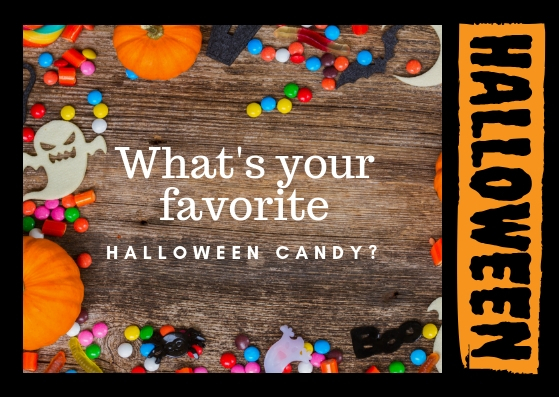 I thought it might be fun to do some research on Halloween candy and our most popular treats. First, did you know that Americans spend about $2.5 billion (that’s right billion) on candy during Halloween? People Magazine did a poll of the favorite Halloween candy by state and somehow, candy corn was #1 in five states. I'm not sure what's wrong with those people because YUCK! 25. Whoppers – Malted milk balls. Not a fan. 24. Toblerone – This candy is originally from Switzerland, but it’s caught on in the US now. 23. Smarties – Are these the same as Sweet Tarts? 22. Air Heads – Soft, chewy and sour, so they're good if you like sour candy. 21. Sour Patch Kids – People love sour candy that then turns sweet apparently. 20. Jolly Ranchers – Colorful, full of flavor, a little sour & sweet. These are YUM! 19. Swedish Fish – I have honestly never heard of these. Maybe it’s a regional thing? 18. Candy Corn – Again YUCK! The National Confectioners Association claims 35 million pounds of this stuff is produced every year. Mostly I think they sit around in the candy bowl until everything else is gone so you HAVE to eat them. 17. Hershey’s Kisses – Did you know a machine wraps 1,300 kisses per minute in foil? 16. Dove Chocolate Bars – I go for the Dark Chocolate ones, bite-size are the best. 15. Twix – Cookie, caramel and chocolate together, and it all works. 14. Almond Joy – Why would anyone ruin good chocolate with coconut? 13. Butterfinger – These are good, but I feel like I’m going to crack a tooth trying to eat them. 12. Milky Way – They say this was named after a malted milk shake (not the galaxy). 11. Hershey’s Cookies N’ Cream – I don’t understand the point of white chocolate AT ALL. 10. 3 Musketeers – Did you know there were originally three flavors: strawberry, vanilla & chocolate? That’s where the “3” in the name comes from. In 1945, they started selling only the chocolate version. 9. Skittles – Strangest commercials ever, but they are pretty tasty. 8. Twix 4 To Go – I’m not sure how they managed to count Twix twice on this list. Seems like cheating. 7. Starburst – Chewy, fruity, delicious addiction. 6. Twizzlers – I’ll eat them if I have to, but I won’t enjoy it. 5. Kit Kat Bar – Bet you can’t eat one without singing the commercial. 4. Hershey’s Milk Chocolate Bar – This is like America’s chocolate bar. It’s been made in Hershey, Pennsylvania since 1900. 3. Snickers – This candy debuted in 1930. Best known these days for the “You’re not you when you’re hungry” commercials featuring actors like Betty White. 2. M&Ms – The real question for you is…plain or peanut? 1. Reese’s Peanut Butter Cups - YES…chocolate, peanut butter, deliciousness! Kristin Wallaceis the USA Today Best Selling Author of inspirational and contemporary romance, and women’s fiction filled with “Love, Laughter and a Leap of Faith”. She is the author of three best selling series, Palm Cove Tales, Shellwater Key Tales and Covington Falls Chronicles. Her latest release is a new installment in her popular Palm Cove Tales /Heiress Games series. SECOND CHANCE CHRISTMAS, 1 of 9 holiday novellas in Sweet Christmas Kisses 5. Available now for only 99cents. Thanks for the Halloween candy info, Kristin. Happy autumn! Gotta love chocolate and peanut butter together! Thanks for the info, Kristin. Milky Way Caramels are my favorite. Not always easy to find, so when CVS recently had a few bags, I bought 3 bags.